Get a cashback of Rs 500* on spending Rs. 10,000 in the first 90 days of Cardmembership. Experience complimentary travel with Travel vouchers worth up to Rs. 33,500* and much more. 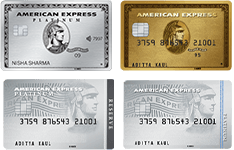 Earn 1000 Membership Rewards® points when you complete 6 transactions each of Rs. 1000 or more in a calendar month. Enjoy greater flexibility in spending with "no pre-set" limit#. Q1. Do you have an existing Credit Card? Q2. What is your average annual income? Q3. How do you typically pay your Card bill? Q4. What type of rewards do you like? Q5. Are premium benefits like lounge access and Golf access important? Enjoy up to 25% off on travel, dining, lodging, car rental and more. Savour up to 20% savings, complimentary wine and more at select restaurants in India and abroad.